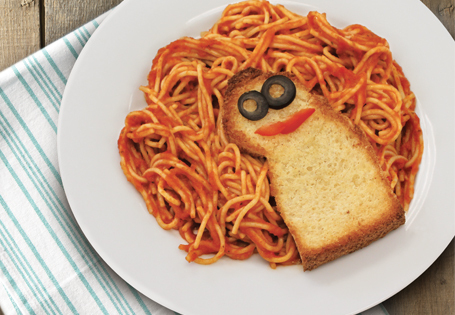 Add a little fun to your lunch with a tangle of pasta! Using a knife, carefully cut the bread into a silhouette shape with shoulders and a head; make it large enough to use the majority of the slice. Discard the crusts. Spread butter on the silhouette slices. Sprinkle with garlic salt. Toast in the oven until golden, about 5 minutes. Cut one garlic clove in half and rub each silhouette, discard garlic. Cook pasta according to package directions. Drain and reserve. In a blender, combine the diced red pepper, zucchini, minced garlic and pasta sauce. Puree until smooth. Pour sauce into a medium saucepan; simmer 10 minutes. Stir the noodles into the sauce; divide between two small bowls. Place each garlic slice silhouette in the middle of each dish with the "shoulder" portion coming off the edge of the bowl. Place two olive "eyes" and red pepper slice "mouth" on each garlic toast before serving. 1/2 red pepper, diced, 2 thin slices reserved for "mouth"